He was teasing me, of course (he also said that I should have called the blog “Lloyds of London,” but then advised me to save that for the reality TV show). But he does touch on a serious point. Like many people out there in today’s work force, I’ve done a lot of different things in my professional life which, combined, give me a diverse set of experiences to write about and talk about. Lisa Belkin had a terrific article about this phenomenon in the New York Times Magazine earlier this year, in which she discussed Caroline Kennedy’s failed bid for the New York senate seat vacated by Hillary Clinton. However you felt about Kennedy as a candidate, Belkin’s basic point was that Kennedy may have lacked experience for the job in a linear-I’ve-been-preparing-for-this-job-all-my-life sort of way (unlike, say, Kristen Gillebrand, who eventually got the nod). But the sort of “kaleidoscope” resume that Kennedy brought to the table (e.g., lawyer, writer, fundraiser, parent) is increasingly the norm in today’s economy, a by-product both of the dot-com economy which threw traditional career trajectories out the window, as well as the reality of women returning to the workforce after having children. Belkin’s article also reminded me of some of the arguments raised in Malcolm Gladwell’s latest book, Outliers. In a New Yorker article last Fall entitled “Late Bloomers: Why do we Equate Genius with Precocity?,” Gladwell – drawing on extensive research by David Galenson at the University of Chicago – points out that many of the world’s most celebrated “geniuses” – people like Paul Cezanne, to name but one – didn’t start out as geniuses right off the bat, but rather took years to culivate their talents. So it wasn’t that Cezanne was discovered late (as is sometimes erroneously thought to be the case); it’s that he simply wasn’t very good at what he did until quite late in his career. In the meantime, he was experimenting. 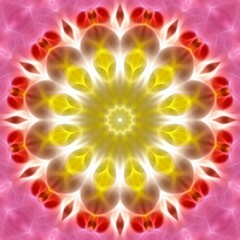 Image: Kaleidoscope FR 5340 1907 by Lucy Nieto via Flickr under a Creative Commons License. It’s the ultimate “life as improvisation” -you just keep exploring and heightening what you find in front of yourself and you eventually find yourself somewhere that makes perfect sense although the path is anything but linear. If you don’t know it already, Composing a Life by Mary Catherine Bateson is all about this. My mother gave me a copy when I was in my 20’s. I come back to it every few years or so – it gave (and continues to give) me clarity on the way I want to be an adult. Thanks, Anne. I’ve actually heard of this book but never read it.